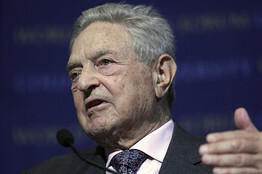 For Mr. Soros, who was also a big donor in 2006 and 2008, it is a matter of being more focused on pushing to get the policy outcomes he wants than on the electoral process, Mr. Vachon said. Mr. Soros gave $5 million each last year to organizations supporting the health care overhaul and the climate change bill, Mr. Vachon said. He also contributed $1.25 million this year to America Votes, an umbrella organization for a variety of liberal-leaning groups, which focuses on the voter mobilization that Mr. Soros has supported over the years. “That’s just where his head is right now,” Ms. Frutchy said. Many major donors, in fact, seem to be drawing a distinction between continuing to support left-leaning policy organizations and other institutions, and giving money to political groups focused on this election. In other word, Soros and Lewis will only support intelligent, honest leaders who have the integrity to end the racist, unethical, immoral "War On Drugs" in America. Obama and many of his Democratic drones are opposed to legalization of marijuana and so are going to be leaving politics soon. "I'm supporting the campaign because I support common-sense reform of the nation's drug laws," Lewis said Saturday in a statement. "I admire the effort, energy and commitment of the people involved in the campaign, and want to help them get their message out to the voters." Lewis, whose net worth Forbes pegs at $1.1 billion, has given millions to the drug reform cause in the past decade and a half. In 1996, Lewis donated $500,000 for Prop 215, California's ground-breaking medical marijuana initiative. He gave another $1 million to Prop 36 in 2000, which diverted thousands of nonviolent drug offenders from prison to treatment. And he has donated $2-3 million a year to fund other drug reform efforts. He is the man who nearly broke the Bank of England. And in an intriguing headline in today’s WSJ, readers are reminded that hedge-fund maven and philanthropist George Soros also backs the legalization of pot. “Our marijuana laws are clearly doing more harm than good,” Soros writes in his opinion column. Soros said he advocates regulating and taxing marijuana, and he blames racial prejudice on pot laws in the U.S. The topic is a familiar one for Soros. He also supported a Massachusetts effort two years ago and several other state initiatives elsewhere to decriminalize some instances of minor marijuana possession. This time, Soros’s column comes just before Californians will vote on Proposition 19, which aims to legalize recreational marijuana use and possession. “Just as the process of repealing national alcohol prohibition began with individual states repealing their own prohibition laws, so individual states must now take the initiative with respect to repealing marijuana prohibition laws,” Soros writes. The U.S. Attorney General has said the Obama administration opposes the ballot measure and has warned its passage could hurt federal drug enforcement. Of course, Deal Journal has written previously about Soros’s differences with President Obama, whom he had supported. Gee, New York Times... this news is real hard to analyze. Neither sell-out, slat-Earther democrats nor republicans opposed to drug law reform in America shall get the support of the true leaders of progressivism in America or the world... nor of the leader of Progressive. Wrong, mainstream journalists... it's about the pot! Submitted by Quest-News-Serv... on Fri, 11/26/2010 - 02:39. Submitted by Norm Roulet on Fri, 11/26/2010 - 03:03. Mr. Lewis was arrested and charged in New Zealand for possession of marijuana. Lewis pleaded guilty to three charges and paid a substantial fine, though under New Zealand law he was not required to serve time in jail or prison. According to his lawyer, Marie Dyhrberg, Lewis used the marijuana on the advice of his doctor for pain relief after the partial amputation of his leg in 1998.